Fair Isle can be reached from the Shetland mainland either by the island mailboat Good Shepherd IV, or by 8-seater 'Islander' aircraft. Journey time 20-25 minutes. Please see AIRTASK website for timetables and fares. AlsoAConnecting flights with British Airways can be booked from London Heathrow to Sumburgh Airport in the south of Shetland via Edinburgh, Glasgow or Aberdeen. IMPORTANT: Please allow at least 45 minutes to travel between Sumburgh and Tingwall airports by car in order to connect with flights to Fair Isle or to Scottish mainland. You also need to be at Tingwall airport at least 30 minutes (and Sumburgh airport 1 hour) before the scheduled departure time for your flight. 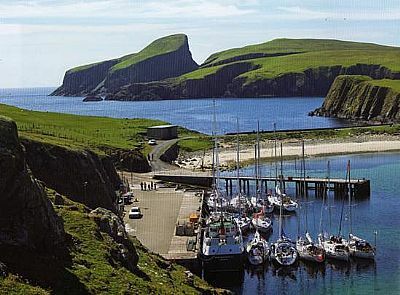 An airport taxi service operates between the Viking Bus Station in Lerwick and Tingwall Airport to connect with flights to and from Fair Isle. (Journey time 15 mins. Fare approx £1.80 per person each way). For bookings please contact Shetland Islands Council Tel: 01595 745745 by 17.00hrs the day before your flight. Car/Minibus/Coach Hire can be organised in Shetland by contacting Leasks, Star Rent-a-Car or Bolts Car Hire. It is a advisable to allow an extra couple of days either side of the days you wish to be on Fair Isle in case of weather delays to transport in and out of the island.